This light and open smoke free home is tastefully decorated and fully furnished for the perfect vacation experience including dishes, linens, all appliances, including laundry, phone, cable, televisions in every bedroom plus a tv, vcr/dvd player and stereo in the living area. Hardwood floors run throughout. The unique loft bedroom with Queen size bed boasts views of the Atlantic Ocean. Wake in the morning to the beautiful sunrise over the Ocean from the King sized bed in the master bedroom. Third bedroom also has a Queen sized bed, tile floors and a walk in closet. Plus the living room sofa folds out to a queen sized bed to allow up to 8 guests. Outside features a beautiful pool and spa with waterfall. A patio plus a deck overlooking the beach to enjoy the relaxing sounds and peaceful sights of the waves crashing on the beach. This home sits on a lot with another 2 bed, 2 bath guest home. If you rent only this main home, then the second home will remain vacant during your stay. If you need more space you can rent both homes. To view both homes go to listing #7029773. We are Bob and Vicki. We have been in the vacation industry for many years and provide only the best properties and services for our guests and friends. This property makes you feel as though you are always on vacation and is directly on the beach! 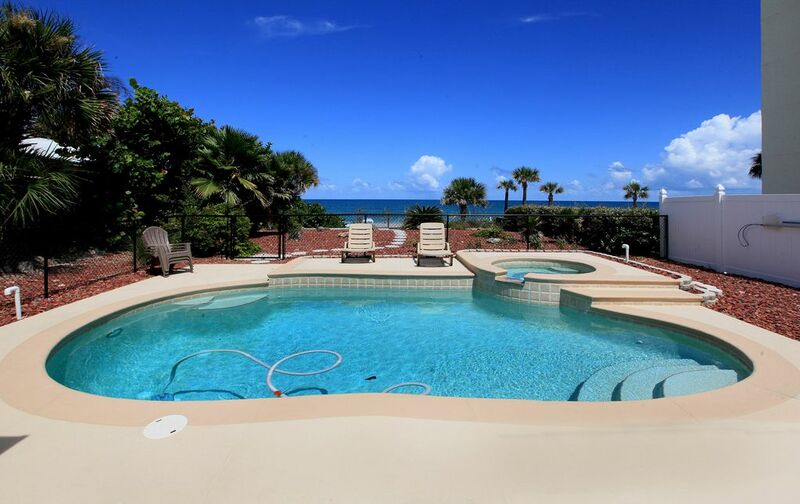 Our home is one of the very few direct ocean front homes with a pool and spa available in the area. Our home is fully furnished with all of the comforts of home, including all dishes and small appliances, linens, bedding, towels, beach towels, and more. We have a spa that is heated at no extra fee and a pool that can be heated in the winter for a fee. We have an observation deck that over looks the beach and a walkway right to the beach. There are many nice restaurants within walking distance of our home. Plus many more features. We take great pride in providing our guests with a nice, clean, fully furnished and well maintained home for your vacation stay. We have a nice viewing deck elevated above the beach for great views up and down the beach for miles. Our home is located directly on the beach. You will be standing on the beach before to step off of the property. See dolphins cruise up and down the coast line in the early mornings. Pool deck plus a observation deck over looking the beach with views for miles. Large great room, dining room table seats 6, and the breakfast table seats 4, laundry facilities, ironing board and linens.All cooking utensils, dish washer and small kitchen appliances.Parking includes a ample open parking. Located in Beautiful Ormond Beach just 4 mile north of the Daytona pier and Main Street, and 1/4 mile South of the Granada, Beach approach. Just 5 minutes to exit 268 on I-95, and 11 miles to Daytona International Speedway. Arrive in only 90 minutes to the Orlando attractions, and 45 minutes to Kennedy Space Center or St. Augustine. We have given special attention to make sure you can relax and enjoy your vacation during your stay in our get away home. Accommodations were great. Property spoiled us for future VRBO stays. Bob was very nice and went out of his way to explain the ins and outs of the houses and surroundings. Very comfortable and very clean. Our family stayed in these two properties together. Setup was wonderful. Our mom in a wheelchair had a beautiful view in the front home and a bedroom with a full bathroom and could easily get to the observation deck. The beach can be driven on so that made trips for her there easy and fun as well. Our teenage children had a great time at the beach and at the nearby activities. Plenty of stuff to do here within a short distance but it was great to have the beach where it was not so crowded. Owners were wonderful to work with and the houses were fully equipped with everything we needed. Pool and hottub are great and kitchens are fully equipped. We made most of our meals in the units. We will definitely be staying here again. Thanks for a wonderful stay! Nice homes on the beach..! What more could you ask for? I recommend staying here! Very nice homes on the beach. Owners were a pleasure to deal with. Recommend staying here. This property was everything we could have imagined. Clean, comfortable, the pool and beach was amazing. We enjoyed our week here and would recomend staying here to anyone looking for some fun and relaxation. Thank you for giving us the best week at your beach house! First time joining tese 2 families together. took about 3 weeks of checking properties based on layouts, bedrooms and other amenities such as a pool. This fit all the needs. we rented both houses and the 4 adults lived in the main house and the 6 kids had the guest house. each family had 3 kids. the view looking out to the ocean was awesome. to wake up each day, grab a cup of coffee and go sit on the extended deck over the beach was incredible way to start the day. never being in Daytona before, the beach itself was a huge asset. not crowded, and wide enough that you can do sand things without any interference from others. the house had many amenities. the pool & spa got used every evening after dinner. very relaxing. the house was equipped with many items from previous families such as pool toys, umbrella and the like. all the necessary items in a home were in the kitchen and bathrooms. plenty of towels, kitchen applainces and small wares, wahser & dryer in both houses-anything you needed was there. nice restaurant-upscale-across the street for meals. very good food & service. house was close for anyting we wanted to do. i would highly recommend this house for any group. It is our goal that our homes are equipped with everything a guest needs to have a great time, and that every guest enjoys their stay here as much as these two families did. Local beaches (surfing, swimming, relaxing), Daytona International Speedway (Daytona USA), local short track dirt & asphalt racing, golf, tennis, fishing(surf, back water & deep sea), Ponce Inlet Lighthouse, State parks, Biking, Canoeing, boating, freshwater springs, Seaside Music theater. Day trips: St.Augustine, Kennedy Space Center, Outlet shopping, Orlando theme parks. Weekly Rate: $2800 - $6500 Rates start at $2,800.00 a week and go up depending on the season and special event call for the price of the week you are interested in and we would be happy to answer all your questions.